Dan: Should we cook the whole thing? Let's cook the whole thing. Life is short. Laura: Yep. Let's make it even shorter. 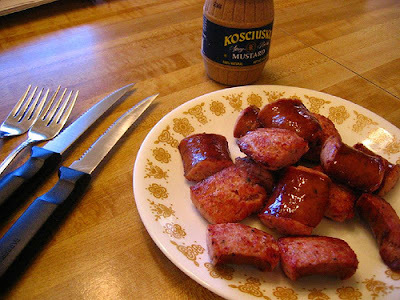 Thus began our breakfast from the other day, consisting of three-quarters of a pound (split between us) of delicious polski kiełbasa from one of our town's local Polish delicatessens. Cost? $3.49. Calories? I don't want to know. Grams of fat? No comment. Preparing this breakfast was a snap. 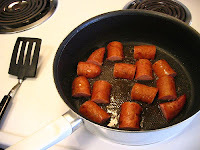 Slice up the sausage both crosswise and lengthwise into manageable chunks, and fry in a nonstick pan for three or four minutes per side on medium-high heat. 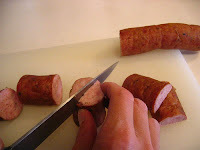 The purpose of today's post is to begin a discussion about energy-dense food, and to explain why it’s actually okay, on occasion, to eat food like today’s Polish sausage, especially for breakfast. This delicious sausage might be pretty high in fat and protein, but that does not mean it is by definition unhealthy. It’s only unhealthy if you're sedentary and you eat this kind of food to excess. I know this will sound heretical to those readers conditioned by the food industry to believe "fat is bad." But on a typical Sunday, where our afternoon plans might include a five-mile run, a long hike, or two hours on the local tennis courts, we've found that modest portions of a protein-rich (and yes, a relatively fat-rich) food like this actually makes for a nearly perfect energy-dense breakfast. What does the term "energy-dense" mean? It simply means you get a lot of calories, and thus fuel for your body, in a relatively small volume of food. Note that you'll need to watch your portion size carefully with these kinds of foods. Just a few bites can fuel your body for a surprisingly long time. And certainly, no energy-dense meal can be good for you if you don't exercise and ultimately burn all of the calories you take in. And if you run out there immediately after a meal like this, you won’t play your best (although you will barf your best). But a modest-sized breakfast of Polish sausage (or perhaps two perfectly boiled eggs), eaten an hour or two before heavy physical activity, will provide you with a far superior fuel than any typical sugar-laden breakfast cereal. Once again, the key issue is: you need to burn the fuel. If you flatly refuse to exercise and cling to a sedentary lifestyle, then quite frankly you should avoid energy-dense foods as much as possible. It's simply too easy for your body to convert fuel-rich food like this into body fat. I'll be returning to the subject of food energy-density shortly, where I'll cover other issues related to diet and athletic training, including the pros and cons of a high-carb/low-fat diet, and what kind of diet will help you do heavy athletic training without compromising your muscle mass and immune system. Part 3: When High-Carb Diets Don't Work. High energy food is great in moderation. I already started to celebrate Christmas with a favorite drink -high sugar, high fat Egg Nog. I dilute the sugar and cream with rum so it's healthier. The food industry may be a bit behind on this one, I think – and they’ll just go where the money is - although it’s hard to say where the circle begins. My impression is that the medical community is starting to get on board with the idea that a higher (non-trans) fat & lower sugar/carbohydrate diet is better for you – since we know that eating a lot of sugar signals the release of insulin which in turn signals, “turn this stuff into fat”. A higher calorie meal, if it includes sufficient fat, is certainly going to make you feel satiated for much longer than, say, a plate of doughnuts with the same amount of calories – or even a plate of lean turkey! I’m with you – if I have a long morning ahead of me I go for scrambled eggs & cheese instead of my usual grape nuts, kefir, flaxseed & blueberry breakfast! The more sugar I eat, the hungrier I get. Thanks for your comment! You make an excellent point on the sugar/insulin issue. Hi Dan. Catching up on your blogs as I eat my morning Grape Nuts. Look forward to Thanksgiving pigging! My sister dates a polish guy whose family owns Ziolo's Polish Deli in New Haven and his family swears by the slow cooking method for keilbasa - low heat over a longer time which produces a crispy exterior and juicy inside. I haven't tried it myself. Also, my mother-in-law buys special Polish sausage in Buffalo, NY and she actually boils it for a really long time... it's spectacular that way. Melt. In. Your. Mouth. I believe that in healthy eating, everything in moderation should be exercised whether it is high energy dense foods or some organic fruits/vegetables. Great article. I think this type of advice is great depending on a person's metabolism. I'm wiry and can get away eating like this, but others with lower metabolic rates probably won't benefit.